Palestinian amora of the fourth generation; flourished in the second half of the fourth century. Few halakot of his are recorded in the Jerusalem Talmud. He appears as the opponent of Hananiah in the question of the fine imposed upon those who illegally make use of tithes (Yer. Ter. 44c; Ket. 27b), and as opposing Mattaniah in a halakic matter (Yer. Shab. 13d; Giṭ. 44b). A question addressed to Jose on the laws of inheritance is given under Judah's name (Dem. 25c), and he is found instructing a Babylonian amora named Phinehas in a question of ritual ('Er. 22d). 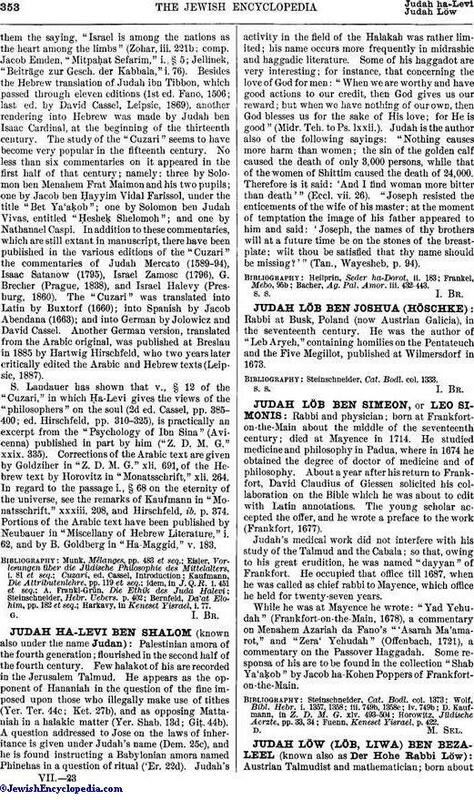 Judah's activity in the field of the Halakah was rather limited; his name occurs more frequently in midrashic, and haggadic literature. Some of his haggadot are very interesting; for instance, that concerning the love of God for men: "When we are worthy and have good actions to our credit, then God gives us our reward; but when we have nothing of our own, then God blesses us for the sake of His love; for He is good" (Midr. Teh. to Ps. lxxii.). Judah is the author also of the following sayings: "Nothing causes more harm than women; the sin of the golden calf caused the death of only 3,000 persons, while that of the women of Shittim caused the death of 24,000. Therefore is it said: 'And I find woman more bitter than death'" (Eccl. vii. 26). "Joseph resisted the enticements of the wife of his master; at the moment of temptation the image of his father appeared to him and said: 'Joseph, the names of thy brothers will at a future time be on the stones of the breastplate; wilt thou be satisfied that thy name should be missing?'" (Tan., Wayesheb, p. 94). Bacher, Ag. Pal. Amor. iii. 432-443.